Festival Basics: The 2018 Secretariat Festival, celebrating the 45th anniversary of Secretariat’s Triple Crown championship, will be set in beautiful Lexington, Ky., central to the area’s horse farms. Saturday’s festivities will be based at The Thoroughbred Center, a working training facility with about 1,000 racehorses on site and home to the North American Riding Academy. 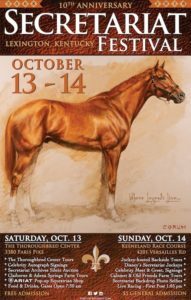 On Sunday, the Festival moves to Keeneland Race Course for live racing at one of the nation’s most beautiful racetracks. Directions The Thoroughbred Center is located at 3380 Paris Pike in Lexington. Take exit 113 off of I-75/I-64 (one exit north of I-64 East). Turn left (NE) onto Paris Pike (U.S. 68). The Thoroughbred Center is 2.3 miles on your right. From New Circle Road turn onto Broadway heading northeast. Broadway becomes Paris Pike. The Thoroughbred Center is 3.5 miles from New Circle Road. Keeneland Race Course, 4201 Versailles Road, is adjacent to the Bluegrass Airport and about 6.4 miles west of the heart of Lexington on U.S. Highway 60/Versailles Road. FRIDAY, OCT. 12 – Cross Gate Gallery, 509 E. Main St. – Welcome Reception – 6:30 – 8:00 p.m.
SATURDAY, OCT. 13 – The Thoroughbred Center, 3380 Paris Pike – Free Admission – Gates open at 7:30 a.m. The Thoroughbred Center – On site backside/trackside tours at 7:30 a.m.; 9:00 a.m. SOLD-OUT; 10:30 a.m.
Kate Chenery Tweedy – Penny Chenery’s daughter, author of Secretariat’s Meadow 9:30 a.m.
Eddie Maple – Secretariat’s Hall of Fame jockey in 1973 Canadian International 10:30 a.m.
Steve Haskin – sports journalist, author, photographer 9:30 a.m., 2:00 p.m.
Steve Jordan – Meadow Stable hot walker 9:30 a.m.
Pat Day – Lil E. Tee, 1992 10:30 a.m., 1:30 p.m.
Chris McCarron – Alysheba, 1987; Go for Gin, 1994 10:00 a.m.
Food, Beverages, and much more…. AFTER-PARTY – with Eddie Maple at Embassy Suites Paddock Grill, 1801 Newtown Pike, Beginning at 5:00 p.m.
Old Friends Retirement Farm Tour– with Steve Haskin & Chris McCarron, departs Keeneland at 1:45 p.m.
KEENELAND LIVE RACING: – First Post – 1:05 p.m.
Oct. 12 – Secretariat Monument Preview Reception at Cross Gate Gallery Friday, Oct. 12 at 6:30 p.m.
Oct. 13 – Canadian International Viewing After-Party at Embassy Suites Paddock Grill, 1801 Newtown Pike begins 5:00 p.m.
Oct. 14 – Limited Seats Available for the Calumet Farm Tour departing Keeneland at 9:15 a.m.
Oct. 14 – Keeneland Backside Legends Tours will now include a stop at the Jockey Quarters. Hall of Fame jockey Chris McCarron will join the 10:00 a.m. tour.